OK, a question (and it is, perhaps, of the trick variety, so think carefully before answering): To one side of you is a collection of some of the greatest art ever produced, all there for the viewing and, if you play your cards right, you can even see it all for free; to the other side of you, mere feet away from the previously alluded to fine-art cornucopia, is a larger-than-life bronze, of competent but pedestrian quality, atop a pedestal and sculpted to look like an idealized, classical heroic version of the lead character in a series of hit movies – indeed, it was created as a prop for one of those films. The question: Which one – the great art, the movie prop – would you stand in line to see and have your picture taken with? Let’s fill in the blanks. That art collection? 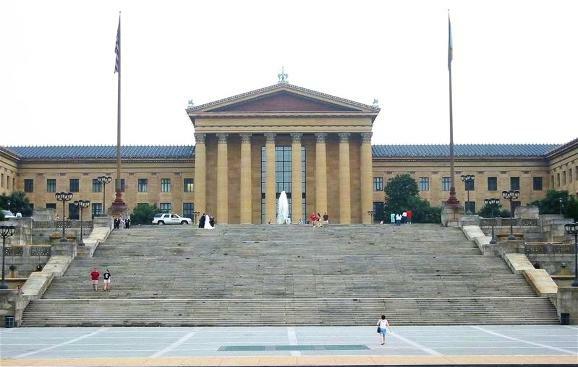 It’s the Philadelphia Museum of Art, one of the world’s finest repositories of humans’ greatest endeavors. That statue? It’s of Sylvester Stallone as Rocky Balboa, fashioned for the movie “Rocky III” by A. Thomas Schomberg. Depending on which touring shows arrive at the museum in any given year, its annual attendance hovers around 800,000 visitors. 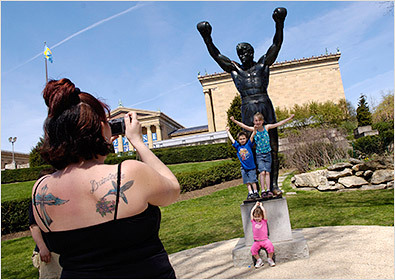 There is no official tally as to the numbers of tourists who want to see and be seen with the Rocky statue (and how many of them who never venture past the statue to enter the museum), but they are there, in queues, all day and into the night, with a curiosity and a passion that many of the museum attendees do not have; it is not uncommon to drive by the museum at midnight or later and see, out of the corner of one’s eye, the flash of a camera, and in that momentary brightening, spy groups of people standing in front of the Rocky statue, striking a similar pose to the figure’s aggressively victorious stance. And it is impossible to know how many tourists and even city residents climb or run up the art museum’s grand steps not with an eagerness to see the new Monet show or Eakins’ “Gross Clinic,” but, rather, to emulate what has, amazingly, become a global, iconic action based on a moment from a 35-year-old movie: standing at the top, arms raised, bouncing weight from foot to foot, staring out at the Parkway below and the city spread out beyond, hearing in one’s head the trumpet-y “Rocky Theme” and saying, to one’s self or aloud, “Yo, Adrian!” You probably know what we mean. To these people, the art museum is a mere backdrop – it has become the movie prop (the museum steps are even now referred to as the Rocky Steps – just Google it), in a supreme example of the reality-distorting power of popular culture and iconography, the defining image and the empathetic moment: we are all “Rocky,” but we are not all that Jasper Johns in the hall, or those Duchamps in the back room, and we are not all what many in the “Rocky” contingent think that that building represents: an elitism, keeping the uninitiated at arm’s length. Though this is not true – there is far more deep identification and emotion in any gallery of the museum, and a greater opportunity for life-changing sudden awareness, enlightenment and growth there than can be had by posing with the Rocky statue – it is, however, a truism, a “truthiness” felt by and strongly held by many, if not most, “regular” people. What is it, in terms of placeness, that draws people to the Rocky statue? Is it more fascination with all things movie-ish, or does it have something like the presence of a shrine, or, in the manner of Grauman’s Chinese Theatre, in Hollywood, with its collection of stars‘ hand- and footprints, is it – within its context – representative of both? Why does it attract so many when superior sculptures nearby get nary a notice? And, the question has to be asked, what is it that makes those others “superior”? Who says they are, and why? 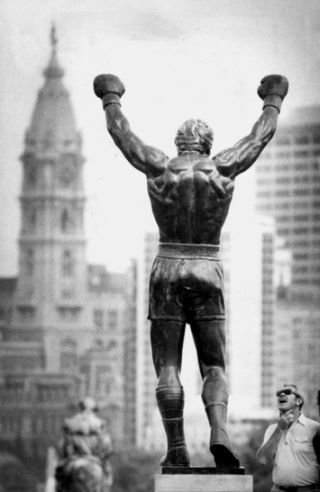 Is the Rocky statue “art”? By what definition of “art” is it not? And who says nay or yea? Does it come down to the difference between what’s good for you and what’s fun for you? Is it a flashpoint in the people’s art vs. snooty art divide? Or is it something more profound: Does the little area at the foot of the art museum steps, with the gladiator-ish bronze boxer installed there, have more placeness, make us feel better to be there, than the museum, with all its value and importance? Or is it simply a matter of context and siting: Would there be as much interest in this semi-artless creation if it had remained at the Spectrum arena, where it was ensconced for a while, or more interest had it stayed at the top of the steps, where it was positioned for the movie and then left there until enraged art aficionados booted it off, calling it an insult? In other words, are the lines of snapshooters there because the statue is there or because the steps are there, and that the steps give the statue a life that only its association with the building and its idealized vision of it in the movie can bestow? 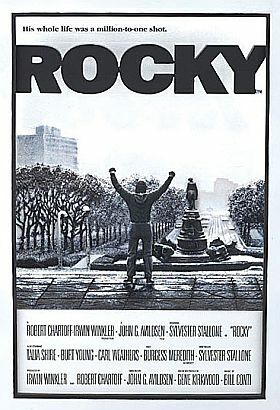 Is Rocky the draw, or is it our cultural memories? Rocky or “Rocky”? Is it actual placeness or, like a contact high, contact-placeness – the thing it’s in “contact” with being a totally fictional entity? 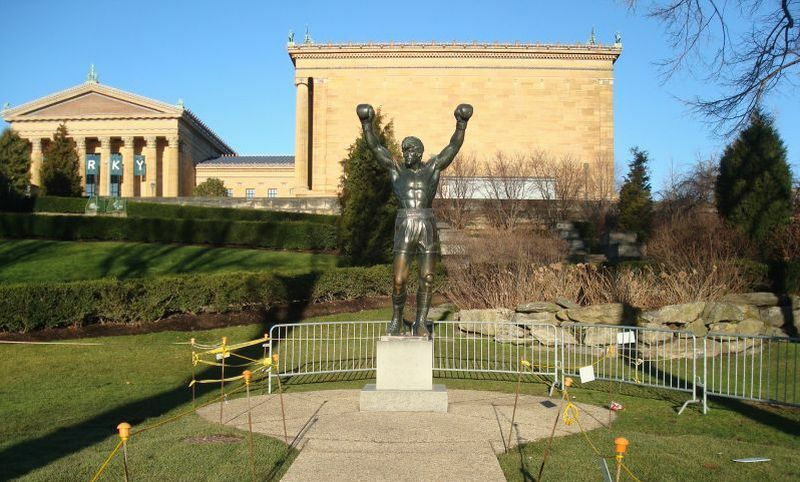 We heard someone say, recently, that when they have out-of-towners visit them here in Philadelphia – a city that offers venues for great theater and music and art, and sports, too – the only two places they are sure to take them are the Liberty Bell and the Rocky statue. A place can be a simple line drawn in the dirt, or, by extension, a structure: a wall, its placeness created by its bulky solidity and seeming eternal position in space and time, a counter-force holding back the sloped earth and coming in close contact with three of the four elements. As it intersects other lines and structures, the wall acts as one part of an ensemble that encloses a measured area and becomes a building, a shelter, a dwelling. A wall can be a starting point or it can be an end, a boundary of a real or imagined limit, or a bitter disputatious marker and symbol of what it contains or excludes. This enormous dumb slab, in a microcosmic sense, like the Berlin Wall – a far more political and economic line than this one, but a line nonetheless. Since the Norman conquest, determining the metes and bounds of property is a system little-altered by the intervening ten centuries of practice. Nearly a quarter-century ago we purchased a mid-1800s stable as an art studio – at that time, it was being used as a parking garage – a mere half-block from our house. 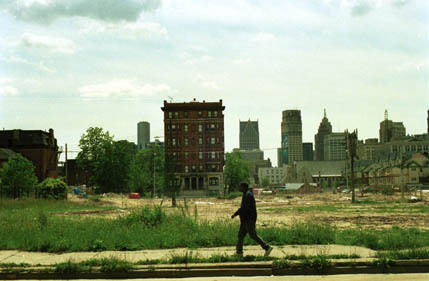 If we had owned the land between our house and the stable, it would have created a mini-estate, but our properties were divided by both a city street and someone else’s yard. We could see the stable’s profile out our window and imagine the once-contiguous landscape. The building’s form is a simple, straightforward structure: stone walls with 20’-wide spanning trusses, peaked roof, a clerestory of windows on one side – built into a steep hill, so that it always has appeared to have a limp. 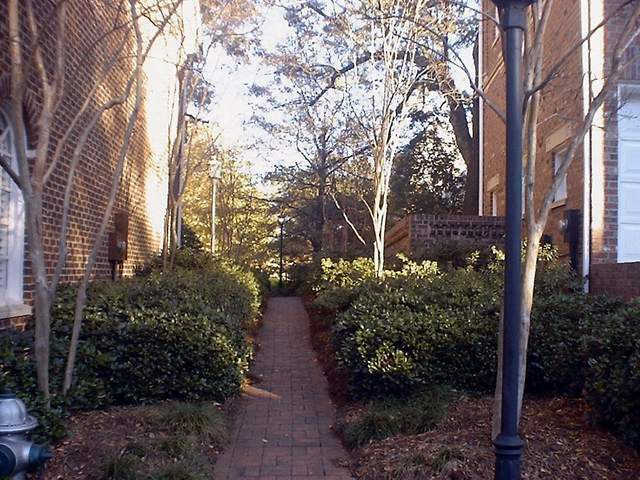 Adding to its peculiar stance was the upper side’s northeast-facing wall, an 18” thick masonry wall, fifty feet long, visually looming like a giant billboard fallen to the earth, and its bottom acting as a retaining wall that holds back the yard above its grade. 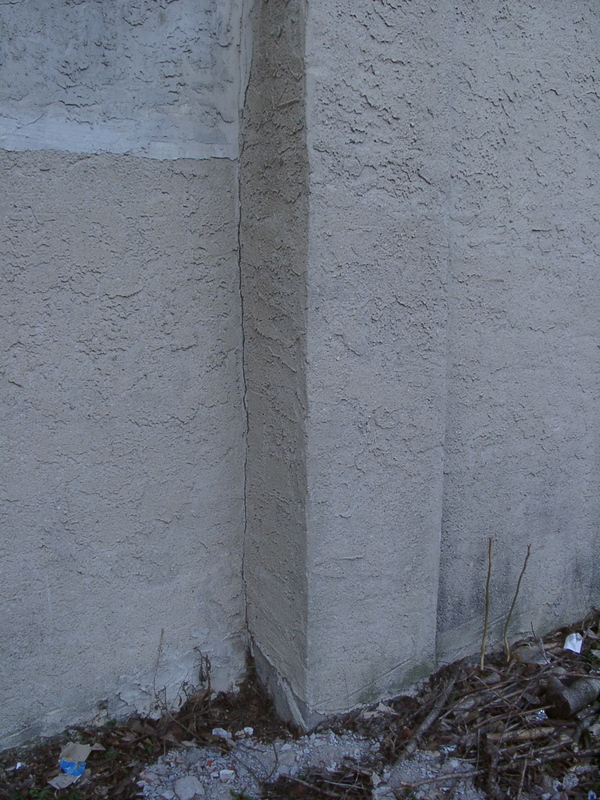 Besides the wall’s size, the lumpishness of its uneven surface makes its appearance all the more strange: it widens and thins at various spots; there are unusual pilaster-like protrusions, vestiges of buttresses perhaps; there are distinct sections, almost as if a few different walls were merged together, creating a layered effect with changes in plane. It is definitely a wall with a past. From the get-go this wall was problematic, since there were considerable water-management problems. Mother Nature provided our first breach in the wall’s well-being, something which had been ongoing way before we appeared on the scene. 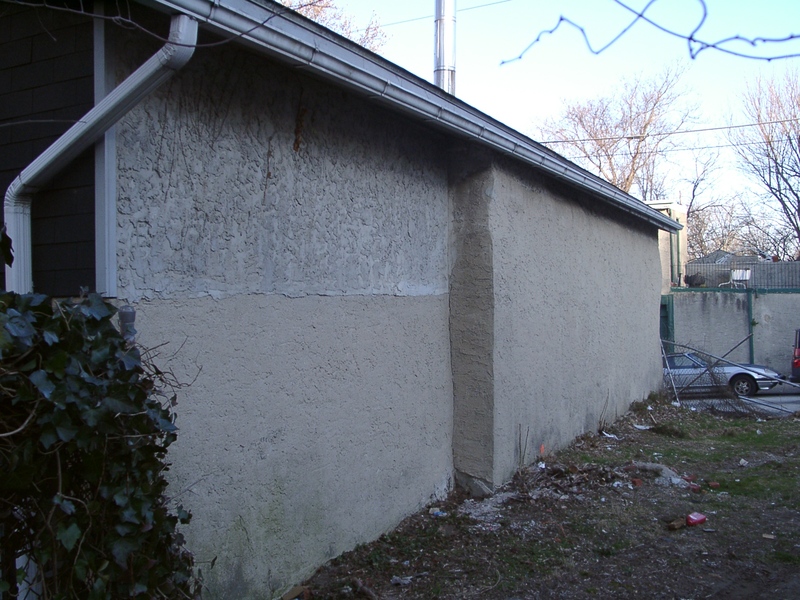 Moisture entered the wall from both the bottom and the top, largely due to an old porous rubble construction, assaulted by direct contact with ground water for a depth of 4-5 feet at its base, and poorly realized, leaky gutters at its roofline that brought the water inside. When we took ownership of the place, a pleasant older woman lived in the house with the higher adjacent yard, and she was very amenable to us using her property to get our only access to the wall. We were starting to feel that the wall’s issues were just natural ones, but when the pleasant neighbor’s sister moved in, arriving like the Wicked Witch of the West, one of the first things she spit out at me while shaking and pointing her gnarled finger, was, “That wall belongs to me.” This battle over the wall continued for many years, mostly in the form of snarling, glaring and not speaking, and also not allowing us access to our wall. We never understood any of it. After doing some research, we learned that the neighboring house, the one that the sisters inhabited, and our stable once had been owned by the same family, and at some point the property was divided. 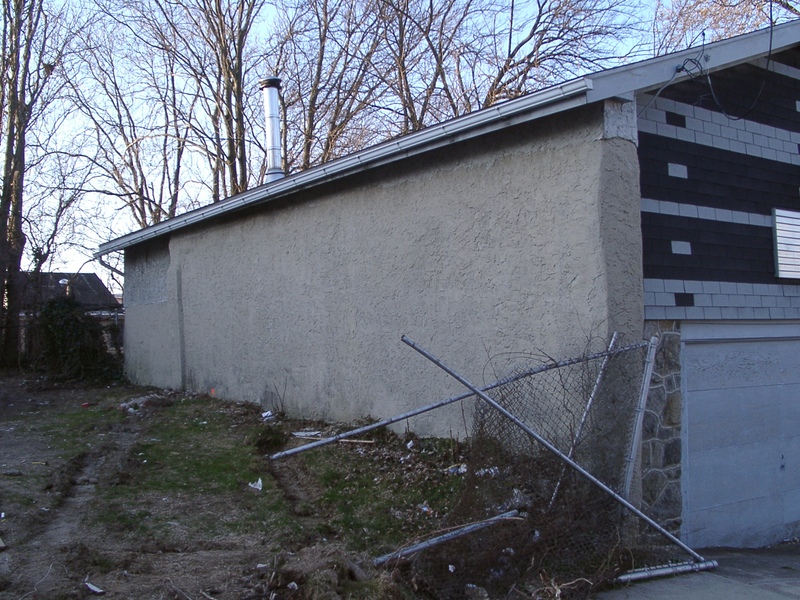 Sometime in the 1930s-40s, a house was built attached to the stable (by an uncle of the remaining sisters), and so the wall in question became a party wall. That might explain its thickness and its weird lumpy profile. The battle continued with the Wicked Witch, as she encouraged her few generations of indistinct bloodlines, who had moved in with her, to throw things up on our roof and down into our back yard, causing us to call the police more than once when they tried to climb onto our roof to retrieve their items. We never had any idea of what she wanted the wall for, or why. It was clearly part of our building – our roof sat on it – and nowhere near hers. But for several uncomfortable years it was a line drawn. A few years ago, when the brood left the house after the city found it unfit for habitation, there was an attempt by them to put together a scheme with some unsavory investors to rehab the old homestead and build two new houses on the empty land next to our wall. 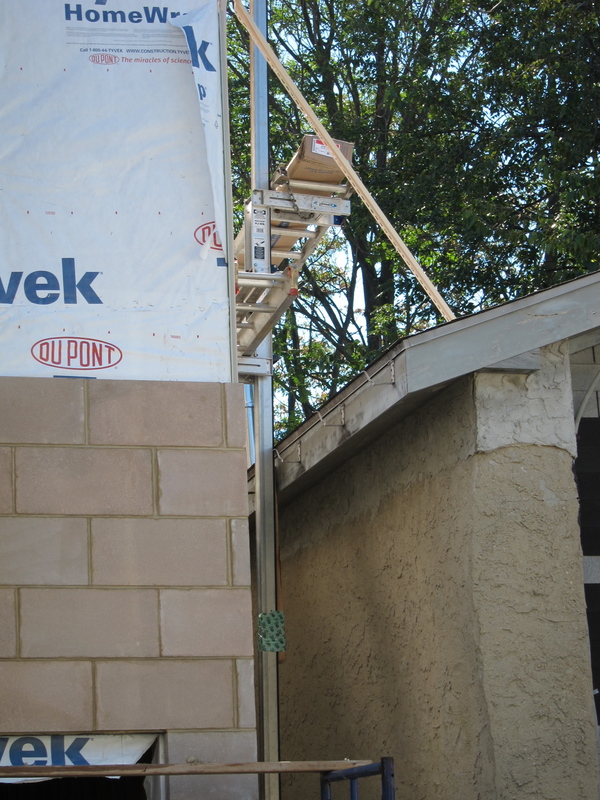 Therein lies the next breach: when the hired-hand surveyors climbed into our backyard and staked it, saying that their property line was on the inside of our wall – inside our building and our yard. At that time, we could have brought in the city surveyors but, instead, we contacted a property lawyer. It turns out that whatever its past was, the fact that we had had exclusive use of it for 21 years meant that we could, essentially, “claim” it by adverse possession. So we did. 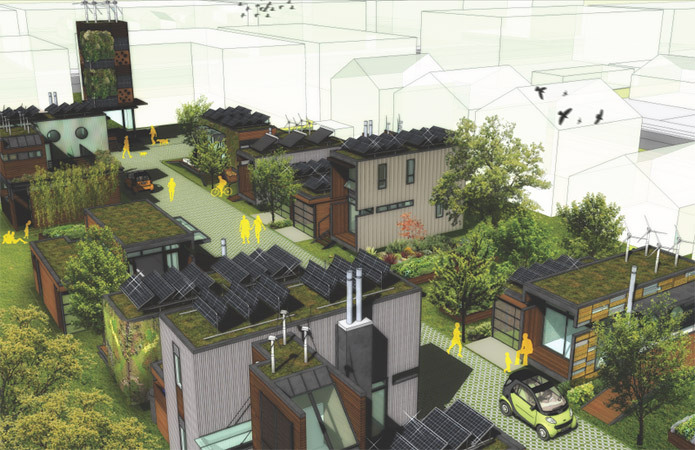 The brood/investor group still attempted to build based on what were bogus dimensions of the site, but city government stepped in and stopped them. The stoppage led to them losing the entire property to the moneylenders. 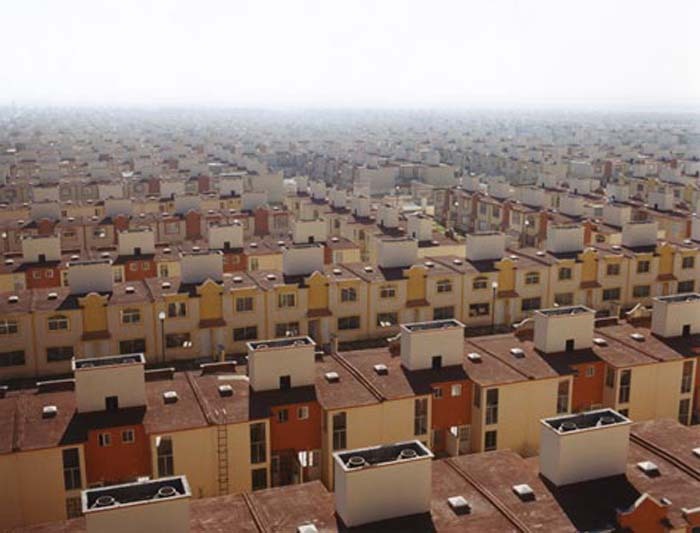 The moneylenders didn’t want to be developers, but they considered building the two houses. Suddenly, they were conciliatory and cautious when it came to the wall. While they pondered their next moves, somebody graffitied the wall, since it was exposed to the open, abandoned construction site, and, maybe, was confused as being a part of it. One day, machinery moved in and quickly dug up, toppled and removed all evidence of the previous early-stage construction attempt – poured-concrete foundations and first-story walls. The graffiti, also mysteriously, vanished. So, you guessed it – new battles began over the wall, with the developer wanting to build too close to it, leaving only a two-foot gap. We argued that it had to be a minimum of three, a legal setback for access and maintenance. It is now a few months into the project, and our wall has been used by this new, polyglot, suspicious crew as a place to prop and store things, a surface for workers to urinate against (the builder has provided no portable toilet), a trash heap, a point of contention over drainage issues and, finally, a near coming to blows over there not being enough space to install their housing’s cheap siding without removing our gutter (an impossibility if they had left only the proposed two feet, and a point of chutzpah under any circumstances). The drainage has yet to be resolved, despite the erection of three very tall towers that will, during a rain or because of melting snow, be a source of major runoff – running off right towards our building, right towards that damnable wall. A wall, seemingly, creates a place, and if you are lucky, a sense of placeness with it. In this case though, whatever placeness it possessed, it came with a price – one we never bargained for. The village green: It is here that demonstrators come to espouse their causes or rail against others’; it is here that on Sundays, in good weather, you can find the drum circle, which ought to be an eye-rolling bit of ‘60s retro silliness but which instead turns out to be a stirring bit of participatory rhythmic fun; it is here where one is bound to spy the age-indefinite, gnomish figure of Father Woodstock standing at the corner beside his message-and-photo festooned bicycle/cart, offering up a gnarly-fingered peace sign to all passing cars, and accompanied by his disturbingly bearded and similarly weathered and anachronistic female companion. 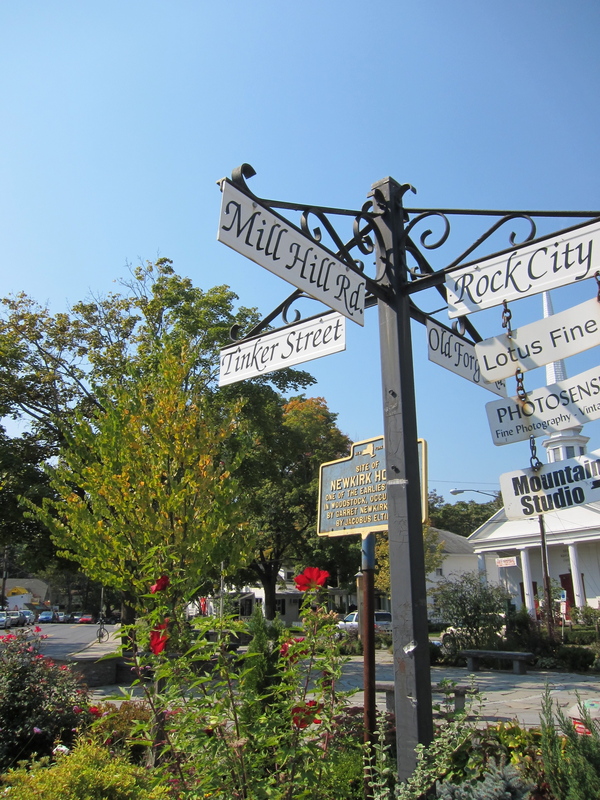 Woodstock may be a place of polar opposites, but the center – the village green – does hold. 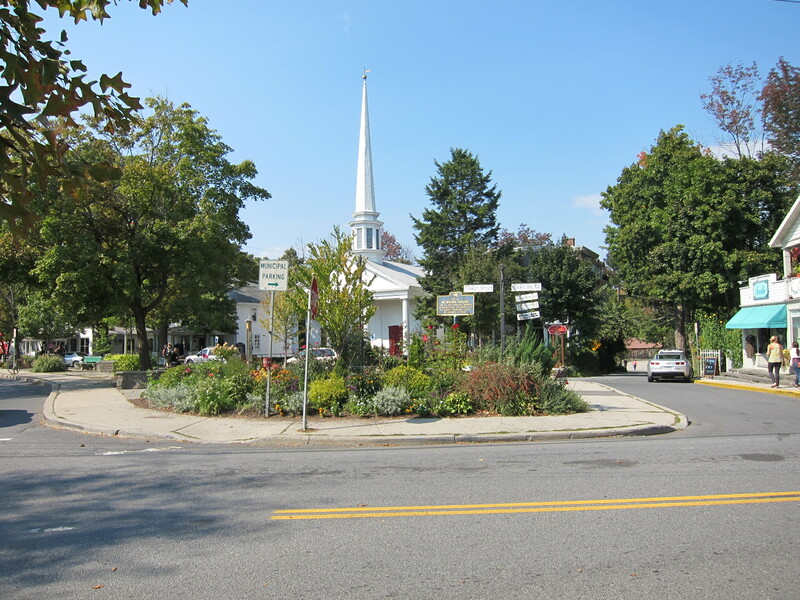 But it is no more than 20 feet from this center that the town’s true heart beats. 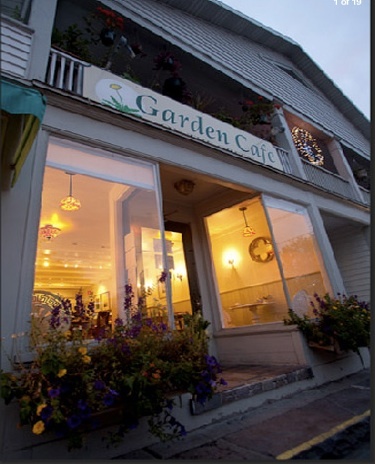 It is the Garden Cafe on the Green, a restaurant that is more than a restaurant. And why it is the heart of things has less to do with chef Pam Brown’s wondrous food – there is none better in town, and, as health-conscious eateries go, possibly none better anywhere – as it does the community that has made this tiny establishment a second home, and the warmth and energy that glows within even as the village green’s activities thrum just beyond the windows. Like theater, there is here exemplified the difference between movement and action: the former, represented by the village green, motivates bodies through space on a stage, in a superficial though eye-pleasing pageant; the latter, action, is based on, explains and alters character and lives, in which things happen because they are meant to happen, cannot happen any other way. Not to put too ponderous a point on it: the village green is about liveliness, the Garden Cafe is about life. It just feels good … no, it feels right to be in the Garden Cafe, and that is why people, occasionally lines of them, are drawn to it, over and over, and for the first time. It is more than some alternative-lifestyle “Cheers” – that place where everybody knows your name. 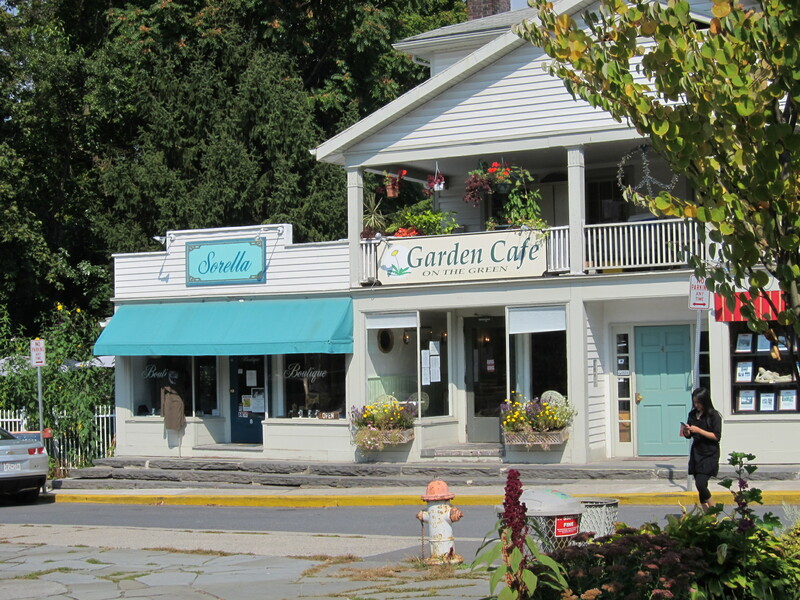 The Garden Cafe is a magnet: of thinkers, of artists, of the most interesting people who dwell in or visit this most interesting town. Look through the window anytime, and you will see people you might want to join, or at least eavesdrop on. Look through the window during the week of the Woodstock Film Festival and you’ll see some very big names there – not because it is the place to be but because it is the place where you can be you. Not trendy – essential. 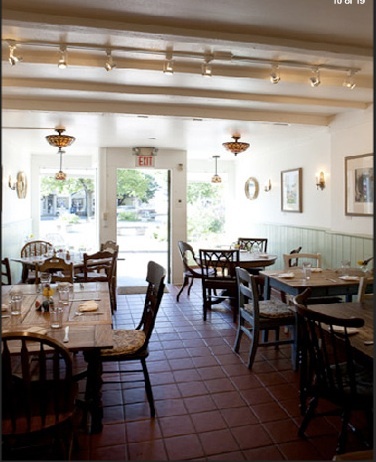 Not a restaurant, or not just a restaurant – a gathering. Not cynically designed to be this, but overtaken by its honesty to be nothing less. Go in, take a spot at a table, or at the counter or outside in the garden, and you’ll see. If you are lucky, there is a place like this in your town. 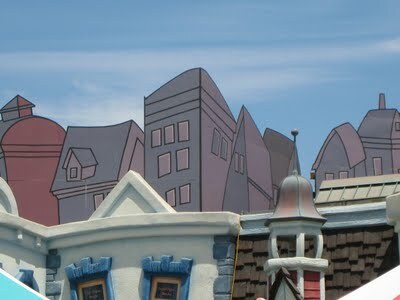 Or you will find one – that vibrates on your wavelength, that beats to your beat – in the town where you are supposed to be. And you will know you are supposed to be in that town because of this spot. It is part of the magic of finding yourself while you believe you are looking for something else.